Please join us for a fly fishing school. On Sunday, June 26th, a Backwater Angler Guide will be teaching a fly fishing school that is ideal for beginners. If you’re planning on fly fishing in Maryland, or anywhere else for that matter, this course is a great introduction to the sport. The school covers knots, casting, gear and fly selection. Class is held from 11:00 AM till 2:00 PM. Cost is $125 per person and includes the use of gear. A Maryland non-tidal fishing license and trout stamp is required and may be purchased at the shop with check or cash the day of the school. Class size is limited to 4 and pre-registration is required. Please give us a call at 410-357-9557 to pre-register. This entry was posted in news on May 31, 2016 by Theaux Le Gardeur. Please join us for a fly fishing school. On Saturday, June 25th, a Backwater Angler Guide will be teaching a fly fishing school that is ideal for beginners. If you’re planning on fly fishing in Maryland, or anywhere else for that matter, this course is a great introduction to the sport. The school covers knots, casting, gear and fly selection. Class is held from 11:00 AM till 2:00 PM. Cost is $125 per person and includes the use of gear. A Maryland non-tidal fishing license and trout stamp is required and may be purchased at the shop with check or cash the day of the school. Class size is limited to 4 and pre-registration is required. Please give us a call at 410-357-9557 to pre-register. Please join us for a fly fishing school. On Sunday, June 12th, a Backwater Angler Guide will be teaching a fly fishing school that is ideal for beginners. If you’re planning on fly fishing in Maryland, or anywhere else for that matter, this course is a great introduction to the sport. The school covers knots, casting, gear and fly selection. Class is held from 11:00 AM till 2:00 PM. Cost is $125 per person and includes the use of gear. A Maryland non-tidal fishing license and trout stamp is required and may be purchased at the shop with check or cash the day of the school. Class size is limited to 4 and pre-registration is required. Please give us a call at 410-357-9557 to pre-register. Please join us for a fly fishing school. On Saturday, June 11th a Backwater Angler Guide will be teaching a fly fishing school that is ideal for beginners. 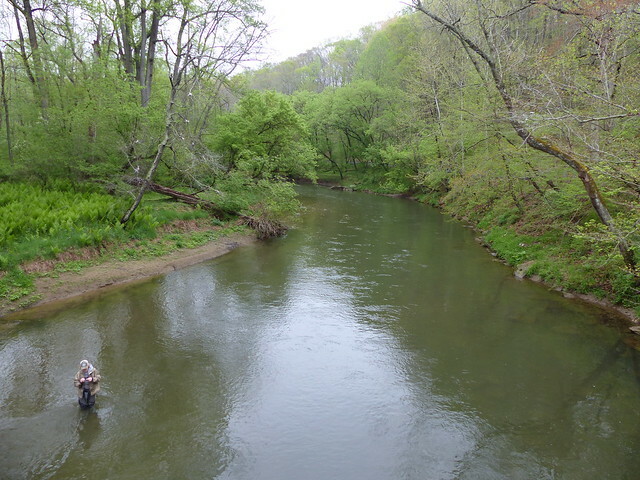 If you’re planning on fly fishing in Maryland, Northern Virgina, D.C., South Central Pennsylvania or anywhere else for that matter, this course is a great introduction to the sport. The school covers knots, casting, gear and fly selection. Class is held from 11:00 AM till 2:00 PM. Cost is $125 per person and includes the use of gear. A Maryland non-tidal fishing license and trout stamp is required and may be purchased at the shop with check or cash the day of the school. Class size is limited to 4 and pre-registration is required. Please give us a call at 410-357-9557 to pre-register. The Gunpowder River is flowing at 80 CFs and is clear and 60 to 64 degrees F. Air temps in the upper 80’s this week have resulted in epic spinner falls throughout the catch and release section. Effective patterns include a suite of Sulpur emergers, duns and spinners tied by Mike Bachkosky including Phunny Emergers, Sulphur Unusuals, and his infamous bright Para-Spinners. Unweighted pheasant tails will also result in a few fish especially in the lull between the last emergence and the spinner fall. Small elk hair caddis and caddis emergers in the #16-18 range and BWO’s in the #18-20 range will also trick a few wild fish-especially early. 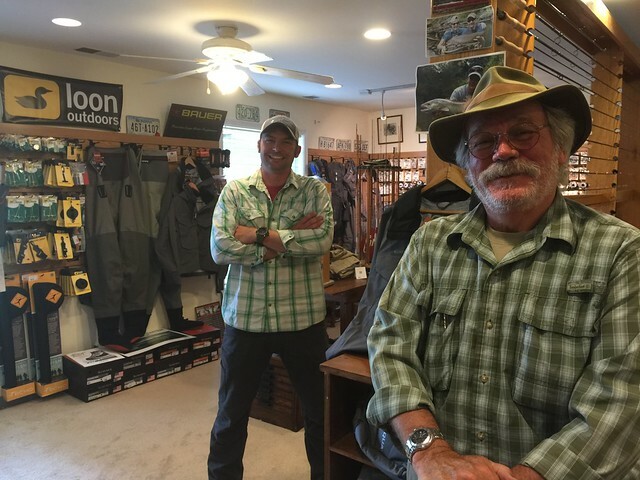 Backwater Angler staffer Carl Cartier and fly fishing guide and instructor Bryan Donoway were recently in the shop together discussing the finer points of Leonard Bamboo Fly Rods and plaid shirts. This entry was posted in fishing report on May 27, 2016 by Theaux Le Gardeur. The Gunpowder is clear, flowing at 110 Cfs and is 56 degrees F. Lime green to a carrot colored orange Sulphurs have been the trick. Caddis emergers from a 16 on up are also working in the riffles. The ongoing rain has one positive result, especially if one has a rain jacket handy–water temperatures have remained mild and hatches are slowly coming off throughout the afternoon. This entry was posted in fishing report on May 13, 2016 by Theaux Le Gardeur. Sulphurs are just starting on the Gunpowder River! The Gunpowder River is clear and flowing at 124 Cfs and is 55F. Leaf out is about a week and a half early this spring. Now the banks are providing some much needed shade. Cadddis emergers and Sulphur wets are working fine. Fish will still take a Hendrickson or rusty spinner late in the evening but with water temps in the mid 50’s count on a late emergence of Sulphurs. We just picked up some great Sulphur patterns from the Post office today that Mike has been tying for us in NY. Check out the new rain jackets from Simms and Patagonia so you can focus on fishing instead of that “old damp feeling”. Want to learn some new tricks? Stop in and talk to the young folks behind the counter at Backwater Angler. 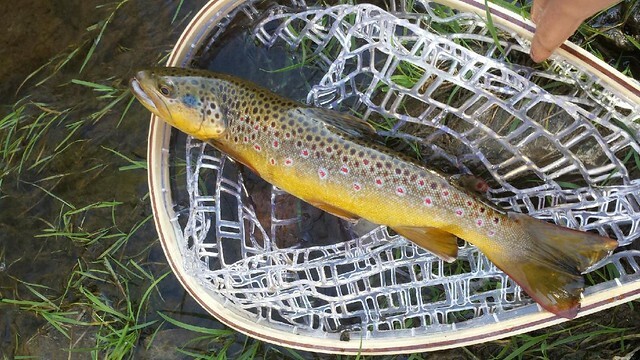 Thanks to Justin Gaffney for the stream report and great shot of an upper river wild brown. It took one of Mike’s Hendrickson patterns underneath a low limb beside a big rock against a bank. When I saw it rise, I thought it was a much smaller fish before It took the fly. I’m glad I had a net with me. This entry was posted in fishing report on May 6, 2016 by Theaux Le Gardeur.